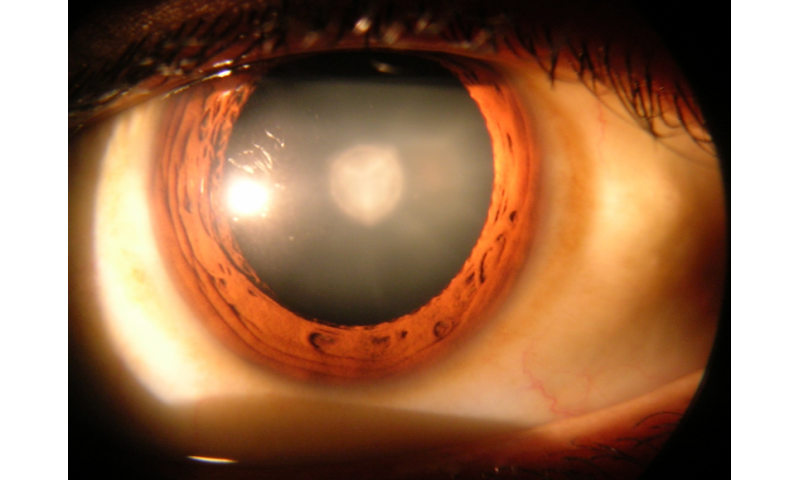 Cataract in human eye. Credit: Wikipedia. Cataracts, a condition in which the eyes' natural lenses get clouded, are the most common cause of vision loss in older people and can be corrected by routine surgery. But congenital cataracts, which occur in infants and children, are particularly serious since they can inhibit visual development leading to permanent vision loss or impairment that cannot be entirely reversed with cataract surgery. A new study has now found compelling evidence that links dynamin-binding protein (DNMBP) to congenital bilateral cataracts and severe vision loss. The study appears in the American Journal of Human Genetics. This discovery is an outcome of an international collaboration between researchers in the laboratories of Dr. Hugo Bellen, professor at Baylor College of Medicine, investigator at the Howard Hughes Medical Institute and the Jan and Dan Duncan Neurological Research Institute at Texas Children's Hospital in Houston, Texas, USA and Dr. Stylianos E. Antonarakis, professor and chairman of Genetic Medicine at the University of Geneva Medical School, and director of iGE3, the Institute of Genetics and Genomics of Geneva, Switzerland. "We were intrigued when 12 individuals from three unrelated consanguineous families of Pakistani descent presented with congenital cataracts and severe to partial loss of vision in both eyes. It was even more puzzling that they showed additional signs of improper visual development. Despite having undergone cataract surgeries, they exhibited no improvement in their visual acuity. This led us to suspect this was a genetic disorder that was affecting more than just the opacity of the eye lens," said Antonarakis, one of the corresponding authors. "We found all 12 patients had mutations in the DNMBP gene on chromosome 10, and even though each of the three families had a distinct type of mutation, it was obvious that the loss of DNMBP was the underlying cause of infantile cataracts and vision loss in these patients," said Dr. Muhammad Ansar, postdoctoral fellow in Antonarakis lab and one of the lead authors of the study. "Also, every patient had two defective copies of this gene, indicating that this was likely a recessive disorder, which is common in inbred populations." "It is striking to see how the fruit fly that looks and behaves completely different from a human has proved time and again to be an excellent model to study human disease. Since the function of many human genes is highly conserved in flies and a plethora of powerful genetic tools is already available in this system, it is becoming increasingly common for human geneticists to employ flies to quickly understand the function of human disease genes," said Bellen. The eye of an adult fly comprises approximately 750 small optical units called ommatidia. Each unit consists of eight photoreceptors and 11 accessory cells, one of which, the pigment cell, secretes the corneal lens. The fly eyes undergo similar developmental steps as the human eye—the pupal precursor cells differentiate, the photoreceptors elongate, pigment cells at the apical area of the photoreceptors secrete a lens and bristle cells at the apical end start forming hair-like protrusions that depend on extensive actin polymerization. "First, we used MiMIC technology to tag the still life (sif) gene, the fly homologue—that is, the fly's functional counterpart—of human DNMBP, with green fluorescent protein (GFP). This showed us that the Sif protein is normally expressed in photoreceptor cells and bristle cells. Then, to understand the role of Sif protein in eye development, we specifically deleted sif gene expression from pupal eyes. The resultant adult flies had subtle rough eyes, a clear indication that the stereotypical arrangement of ommatidia was altered," said Dr. Hyung-lok Chung, postdoctoral associate in the Bellen lab and the other lead author of the paper. "This study has uncovered the gene responsible for a recessive Mendelian disorder that causes infantile cataracts and blindness of varying severity. We think our pedigree and molecular analyses will help clinicians and geneticists provide accurate genetic counseling and diagnosis to other similarly affected patients," Bellen said. "Moreover, by generating the first fly model of congenital cataract and vision loss, we have embarked on a journey to understand the precise molecular mechanism behind this genetic disorder, which we are hopeful will lead us to promising therapeutic interventions and better quality of life for these patients."